In a test, Mobile Bridge version 4.0 was set up without any foundations by only a few people over the Hongo River in Fukuyama City, Japan. A vehicle travelled easily and safely across it. The bridge is designed to be extended when needed, and disassembled, like a concertina. The work was recently presented at a Japanese engineering symposium. The bridge design uses patented technology with a scissor-like structure and mechanism, which means the bridge and its lanes expand simultaneously. It's ready for traffic within an hour. The system is compact enough to be transported in a car trailer. Earthquakes, floods and tsunamis can occur anytime, anywhere in the world. This can cause damage to infrastructure, slowing down the response of emergency services. 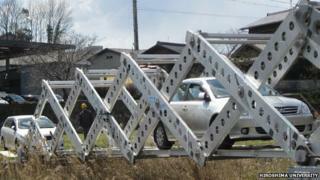 "A crucial point is how to expand a portable bridge. Usually a crane and a team of technicians is needed, but not in this case," Dr Paolo Beccarelli, Assistant Professor in Architectural Structures at the University of Nottingham explained to BBC News. This makes it a quick and simple solution when emergency bridges are needed. Mobile Bridge 4.0 can also be deployed as a temporary structure during repair of existing bridges, avoiding interruption to traffic flows. Dr Ichiro Ario, assistant professor at the Institute of Engineering, Hiroshima University, who presented these results, plans to make Mobile Bridge 4.0 stronger, longer, lighter, more compact and quicker to set up.